I was really fond of peplum trend that is so high up there in the fashion world right now. 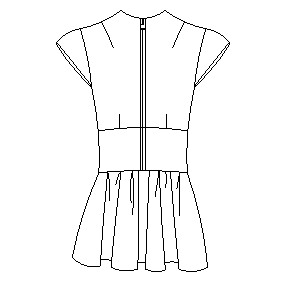 After my first two skirt pdf patterns ( and before my big break-up with PMB), I was very keen to make a simple peplum top pattern to offer my lovely readers. I thought through the style- a "belted" waistline, two neckline darts on a scoop neck, full cap short sleeves, and gathered, rather than a flounced peplum bottom. 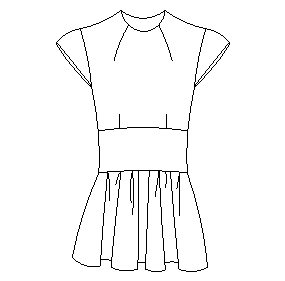 I was using Pattern Master Boutique to help me draft the basic pattern to basic Burda size 34 measurement. I feel bad being so mean to the program creators, to be honest. I have been more than mouthy recently and might have put some readers off buying the product- I am sorry for that. But I believe in constructive criticism as the best incentive for perfection. I also believe that the kind of possibilities that the software like that offers has to be much more straightforward. So I didn't measure myself. I used a set of measuring standards instead for my top. The program kindly helps you draft more or less the style you have in mind. So I didn't draft it from scratch myself. There are a lot of settings to adjust the style, but I didn't mess around with most of them. I only asked to raise the waist by 2 inch and opted for a 2.5 inch belted midsection on my bodice. Nothing else. I printed my top, and here where the first signs of a disaster emerged: I just decided to make sure the sleeve cap's ease is not too large (I hate the struggle of setting in large sleeve caps). To my absolute confusion, the sleeve cap was way too SMALL- it kinda fitted neatly into the back of the armhole, but at the front, the armhole was 2 inches longer that the sleeve cap. I went to the Pattern Editor (the CAD software that comes with the main PMB program), adjusted the armhole, printed the new pattern. I have to point out that I only adjusted the front bodice part- only the armhole length. My next mistake was that I just assumed everything will be ok from then onwards. I have a large cut of crushed lightweight sand colour cotton- perfect for muslins, so I cut my pieces out. I continued with construction: the darts, shoulder seams …. The muslin looked good, and I thought it might even be wearable enough - I loved the crash effect, and I decided to spice it up. I had a bit of shimmer jersey to use it as a waistband, and also a pink zipper at the back to follow neon and neutral combination trend. I kept on sewing parts together, with sleeves, I thought I can sew them in using flat method, where the side seams are sewn after the sleeve in set in already. All well with the sleeves, and on I go to sew the side seams- when to my disgust, I find that the back side seams were about 2.5 inches longer than the front! Measure and re-measure should be my first principle in dressmaking. It should, but it isn't still- and i am paying for it! Ok, this was easy to fix- I just ripped the back waistband seams, and sew them higher, to match the front. But what made me angrier is that it was the front piece that I adjusted, and if i made a mistake there- the front should have been longer on the sides. It wasn't- I had to shorten the back, so as far as I am concerned the fault was in the basic draft produced by the software. I know what you will say- get your paper and pencil out next time. But my whole idea is to use CAD to draft the patterns, I intentionally experiment with paperless drafting. And those kind of faults are upsetting. So I did return the recently purchased PMBv5 upgrade and by now I have received the refund as well. I finished the top, but I am not going to publish a pattern for it. Even if I had a better adjusted version, I just felt- this is not what I really want to offer. And here is the finished muslin. It is also not exactly what I had in mind for the style. The gathering is a bit too tight for my liking and I would lower the waste line a bit. Strangely, my daughter is mad about it, and I had it all finished, so she can wear it with some skinny jeans if she wants. At least she will not feel bad as I would have with my pear shape (I am now officially banned from wearing peplums with a thread of a divorce after I showcased the muslin to my husband LOL. And please, my kind readers, don't judge him- he is always right when it comes to clothes that suit me well, or otherwise for that matter. So no peplums for me) This is why I use the skinny (thigh-less) dressform for these pictures. Well, that is that. NOT a new peplum top pattern , but a lot of food for thought. I like it, I would just remove the sleeves. I was just kinda playing around, I love the sleeveless look too. But Chantelle loves it as it is, so I just left it like that. Your peplum top is so pretty, I can see why your daughter is keen to have it for herself. It would look fantastic with skinny jeans! А в эту программу сколько мерок внести надо? Я так понимаю что для armhole мерки там не было? Do you have the pattern somewhere for download? # Shipweight 11 with crack !